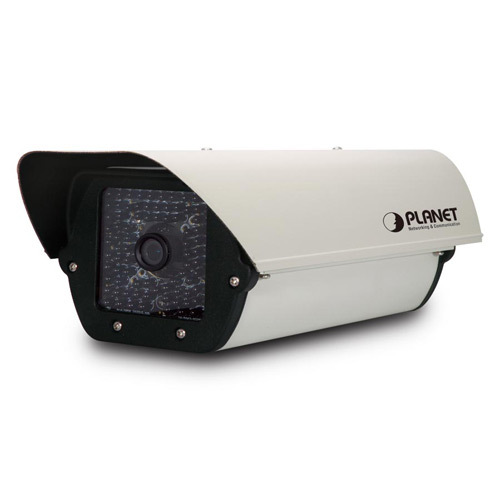 PLANET has announced the ICA-HM351 new generation 2 mega-pixel IP camera, which brings users high resolution outdoor surveillance both in the day and night. The ICA-HM351, the 2 mega-pixel (1920 x 1080) 35-meter IR outdoor PoE IP camera, supports the highest video compression – H.264, which provides small video size and saves you lots of bandwidth usage. The new video compression is the best solution for Internet video transmission. The Multi-Profile Streaming function supported enables the ICA-HM351 to generate H.264, MPEG-4 and M-JPEG streaming simultaneously to differentiate users in different resolutions and frame rates. This state-of-the-art design is considerable to fit in various network environments. The ICA-HM351 provides 2-way audio function for surveillance. It can remotely talk to anyone at the ICA-HM351 site with an additional speaker connected to the camera. Via the ICA-HM351, users can easily communicate to each other by surveillance control. Compliant with IEEE 802.3af PoE standard, the ICA-HM351 can be located in any place where there is no power outlet available. Through Power over Ethernet, the installers are fearless for the power breakdown at the remote site because the network devices can be powered from the central station where UPS is installed. The ICA-HM351 features zero-lux illumination. Its 35 IR illuminators built around the lens bring the clearest vision at night. Through the new LED technology, the illuminator ensures high-quality monochrome images in complete darkness up to 35 meters. The ICA-HM351 infrared Internet camera performs reliable operation in any environment. With the aluminum rugged all-weather housing enclosure, the ICA_HM351 maintains the reliable operation in any environment. Moreover, it has a built-in fan and heater to prevent the machine from being overheated. The ICA-HM351 follows the ONVIF v1.01 and v1.02 standard SDK for users to integrate with the third party software. The ICA-HM351 can also work with PLANET Cam Viewer 3 Lite / Pro Management software and Network Video Recorder products for video surveillance application and provides monitoring, recording and event management functions to secure your property and life. *This device supports Android APP. Download Now! PLANET ICA-HM351 provides integrated surveillance applications to deliver crisp and clear images, perfect for the identification of objects and persons. 2012-07-12 6.D.2.8926 1. Add IPv6 function. 2. Default disable UPnP NAT function.